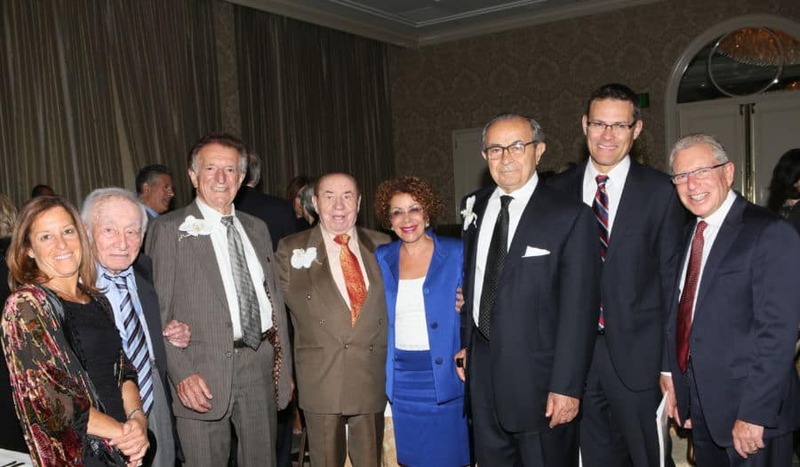 This week, at the Four Seasons hotel in Beverly Hills, some 225 friends and supporters of American Friends Of Tel Aviv University and other charities the honorees support, such as Magbit Foundation, FIDF,CECI, Pepperdine University, Temple Sinai, Bar Ilan University, LAMOTH, Cedars Sinai, among others, filled up a room to recognize the passing of the legacy torch from four philanthropists and pillars of the community to their offspring and the next generations. The uncommonly wise men honorees, Guilford Glazer, Jona Goldrich, Izak Parviz Nazarian, and Max Webb, all posses enormous love for the state of Israel and endless vision. Can you change life? Sure you can! Do you want to change life? You should! And that is what four courageous, smart prominent Jewish men have done for decades. Jon Gurkoff, National Chairman of AFTAU, opened the evening introducing Rabbi David Wolpe, of Sinai Temple, and David Segal, the Consul General of Israel who, in his address, applauded the four philanthropists, emphasizing the importance of higher education for Israel’s future. Rabbi David Wolpe brilliantly emceed the event in which he presented four video interviews he conducted with the honorees, filmed and produced by Ravit Markus and Dan Katzir of New Love Films, both graduates of Tel Aviv University’s Film Department. In the interview each honoree gave his short synopsis of how his philanthropic voyage began till today. All four are bound by their support for Israel and education and with one common desire, to see their passion of giving and their devotion to the state of Israel, the Jewish people and Holocaust remembrance be passed to the next generation, their children and grandchildren, in order to secure the future. The challenge we all have today is that we cannot rely on a few families to secure the future of benevolence; everyone needs to chip in. These four men of fortitude, and leadership by example, have carried the torch till now. It is now the task of the next generations to take up the mantle of leadership and carry on their philanthropic legacy. When a nation strengthens its education web, it strengthens itself. That is why, investing in education in Israel is a the guarantee policy to strengthen the Jewish nation’s future. I often wonder, do Israelis know how much strength is injected into their daily life from abroad? They need to hear what Guilford, Jona, Izak and Max have done for the state of Israel, the Jewish community and beyond, these past 65 years. For sure they have made the world a better place. They have empowered others. They are the founding generation who have empowered the next ones to do the very same. My beloved late mother was a Holocaust survivor who, at a very young age, had everything taken away from her, parents, home, future. Surviving the carnage she always told me that there is only one thing no one can take away from you [a Jew], which is brain, education. Izak Parviz Nazarian: is the Godfather of the Iranian community; he had to flee Iran during the Islamic revolution. This righteous man has Zionism and the love of Israel and the Jewish people in his and his family’s DNA. Max Webb: during the Holocaust, survived eighteen labor and concentration camps. He believes that God made a miracle allowing him to survive and thrive. Education is on Max’s top of the list of causes. His name is on Tel Aviv University’s Max Webb Family School of Languages Building, on Sheba Medical Center and the Anna and Max Webb School of Psychology at Bar Ilan University. You ask Max, why languages? So everyone can communicate. When he is asked when will he stop, his answer is, ‘Jews are never done’. In this evening the torch of leadership and philanthropy was officially passed to the next generations: Erika Glazer, daughter of Guilford Glazer, Melinda Goldrich and Andrea Cayton, daughters of Jona and Doretta Goldrich, Dora Kadisha, daughter of Izak Parviz and Pouran Nazarian, and Chara Schreyer, daughter of Max Webb and Sala Webb, of blessed memory. As they received the crystal engraved flame on behalf of their fathers, Rabbi Wolpe posed each one the question, “What would you want your family to learn about philanthropy from you?” Each of these women have been empowered by their parents and already represent the next generation of philanthropy and have themselves have incorporated the philanthropic legacy of their exceptional fathers into their lives. Rosalie Lurie is the Senior Director of American Friends of Tel Aviv University, Western Region; David Dorfman is the Associate Director of the Western Region. You want to join the next generation of Jewish philanthropists, visit the AFTAU website: www.aftau.org. As the new generation of Jews become farther removed from what their parents faced, “the danger of the extinction of a nation,” they are faced with new challenges. They too need to learn to care and make things happen so that they may become heroes of action just like Guil and Jona, and Izak and Max.